And The Return To Love"
Hi, find out how to return from anger to love. How Do We Get From Love To Anger? How Do We Get From Anger Back To Love? New web pages. Read stories contributed by good people like you, wanting to make things better, such as Kayla, who's having trouble with her anger and thinking, I Must Be A Psycho. This next story is from a man who feels that his anger is tied to his financial difficulties: My Financial Struggles And My Anger. And finally, a young man feeling great loss due to his girlfriend's alcohol addiction: I Lost My Best Friend, My Love And My Future To Alcohol. You already know that most anger problems are in the closest relationships...that's why police officers will tell you the most dangerous calls they make are domestic violence situations. You were born with the need to love and be loved. Even the best parents can't meet that need perfectly, so you experienced pain and sorrow. Then you naturally were afraid that you were going to get hurt again in the same way, so you went to anger, because it is the protective emotion. The only thing is, this made it worse not better, and your needs were still not being met. Love makes us incredibly vulnerable, and anger gives the illusion of power to overcome the vulnerability. 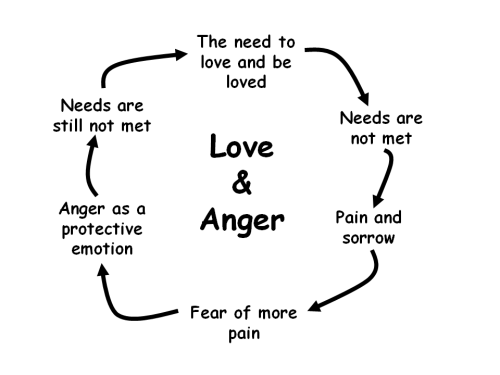 That's how we go from love to anger, and as you have learned by now, anger doesn't solve problems, it creates them. But fortunately the story doesn't have to end there. Now let's look at how you can get back to the love you started with. You never intended for things to go wrong in the first place, because you're a good person. Until you take responsibility for your emotions and your needs, nothing will change...except it will get worse. This is the essential first step to the return to love. Acknowledge that how you feel and what you do is completely up to you. No one is to blame for your emotions are your actions. Next you heal your emotional wounds of the past, that gave rise to your anger in the first place. 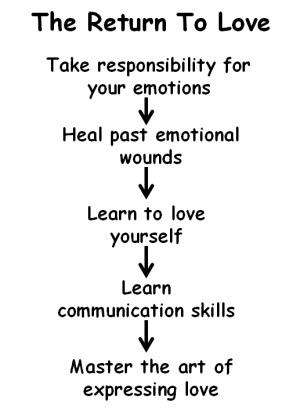 You will learn to love yourself during this process. Next comes the healthy communication skills, including expressing anger in healthy ways. Last but not least, you master the art of expressing your love...because that's who you are, and that's where it all started. I think you get the picture here. You've got what it takes to do this, by the way. For more specific guidance or information on any of these topics, simply go to the homepage of the site, and enter search terms for what you're interested in. Believe in love. Believe in yourself. Love is who you truly are. . This highly effective audio program, available as a CD or MP3 download, will give you all of the basics of the return from anger to love that you need. Listen to free previews, and take advantage of the full money-back guarantee.